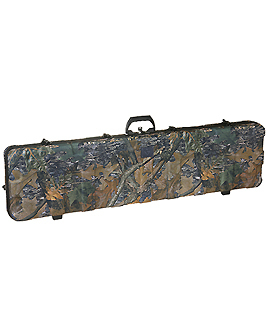 Outback Double Rifle Case, Camo Description Outback Series Double Rifle Case Features: - Strong molded PE construction with 600D polyester inlay - Available in black or Vanguard Illusion Camouflage - Aluminum tongue and groove closure - Deluxe carrying handle - Stable rubber feet - Deluxe foam interior (52 / 70 include velcro tie down straps) Specifications: - Outside Dimensions: 52 1/2 x 13 3/8 x 5 3/8 - Inside Dimensions: 51 3/4 x 12 5/8 x 4 3/4 - Exterior: Camouflage pattern 600D Polyester lnlay - Lock Type: Numeric key locks + Pad lock receptacles(pad locks not included) - Weight: 12.19 lbs. Manufacturer Information Vanguard 9157 East M-36 Whitemore Lake, MI 48189 http://www.vanguardworld.com 800-875-3322 Shipping Dimensions Weight: 14 pounds. Dimensional Weight: 33.61 pounds. Dimensions: 15" (W) x 54" (H) x 7" (D) Weight Disclaimer: * Weight may vary based on configuration.